- Just think! 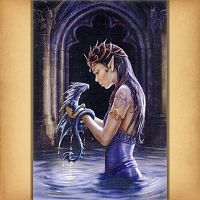 If you had a dragon, bath time would be so much more fun. This otherworldly beauty and her aquatic companion certainly seem to share a special bond. 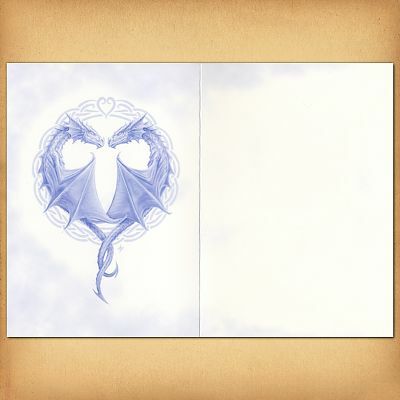 In addition to the full color artwork on the front of the card, there is also subtly shaded dragon art on the inside, as well as a coordinating envelope with even more illustrations. Other than the artwork, the card is blank, so you can add your own message. Card measures 6 3/4" by 4 3/4". 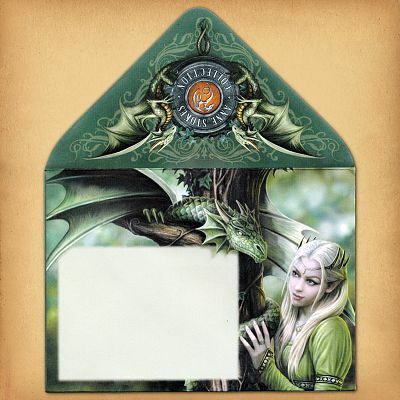 Fantasy artist Anne Stokes really pours her heart and soul into her work. Her depictions of people and mythical creatures alike are incredibly detailed and life-like. Do you have anything else with this design? Yes, we also offer the Water Dragon design as a cross stitch pattern. Will this fit in a 5" by 7" picture frame? Yes! This card makes a lovely and inexpensive bit of dragon art for your walls. 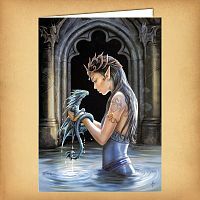 Do you have any other questions about our Water Dragon Greeting Card?